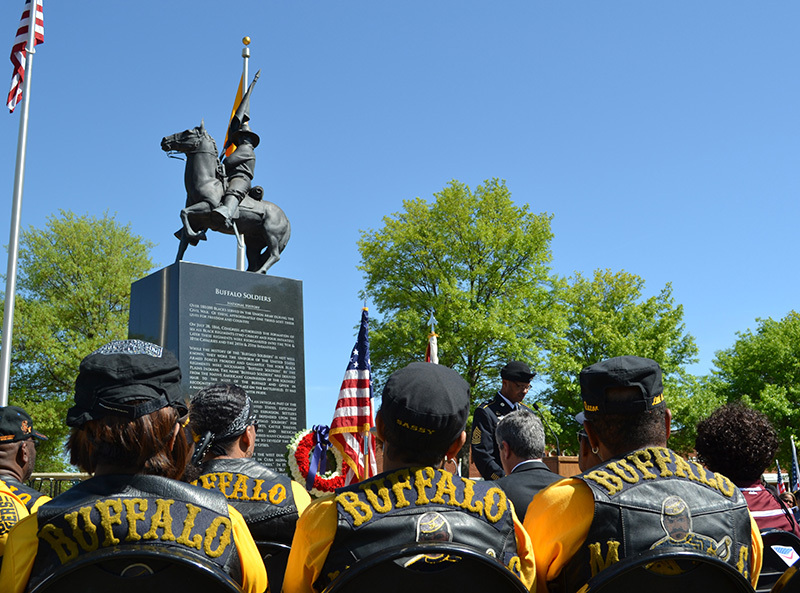 The monument shown here stands in Huntsville, Madison County, and honors the memory of the "Buffalo Soldiers," who served in the first peacetime all-black regiments in the Army. Established in 1866, the regiments fought in several conflicts, including the Spanish-American War in Cuba in 1898. They spent several months in Huntsville recuperating afterward at what became known as Cavalry Hill Park. The 10-foot memorial is located just south of the park and north of University Drive. Local civil rights and political activist John L. Cashin Jr. is credited with proposing the monument in the mid-1990s. The statue was unveiled in April 2010 and was financially supported by members of the Buffalo Soldiers Motorcycle Club of Alabama, some of whom are in the photo.